Quite a few of you have been asking about the design depicted in my site’s new header. As there’s not long to go now till my book is published, I thought I’d give you a bit more of a taste of it. This is the Northmavine Hap. 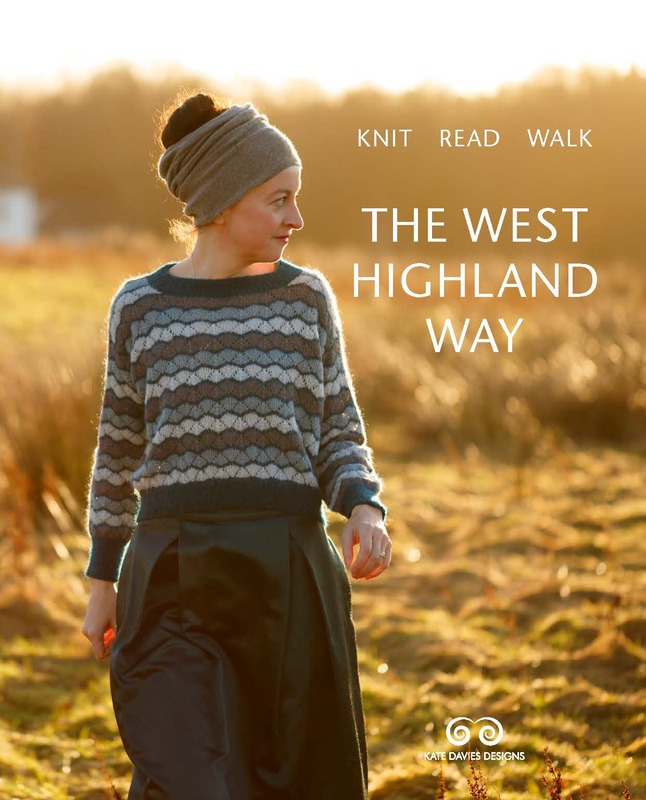 It uses one of the most familiar and easy-to-knit Shetland openwork patterns. This pattern is perhaps most often used to add a decorative border to plain accessories and garments, but I love its simple waves and bold stripes so much that I had to feature it all over the design! Something about the all-over nature of the combination of shaded stripes with openwork makes this hap feel quite fresh and contemporary, I think. The construction isn’t particularly traditional either, and I suppose neither is the distinctive centre shaping . . .
. . . which is meant to echo the smooth scalloped edges of Shetland’s beautiful and famous neolithic knives. 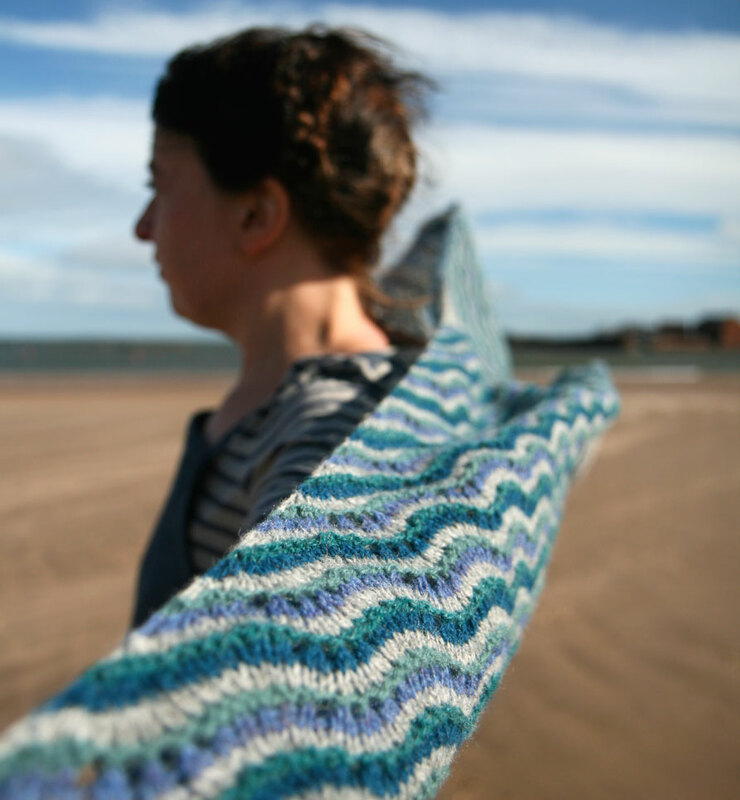 You may remember that, back in May, I was knitting a gigantic swatch, inspired by the colours of sea and stones. I played around with every green and blue and grey in the Jamieson and Smith palette before settling on the parrticular combination I used here. I am really pleased with the end result — the hap neatly mixes a number of traditional and contemporary elements and speaks really well to the Northmavine ‘colour story’ it is designed to be a part of. 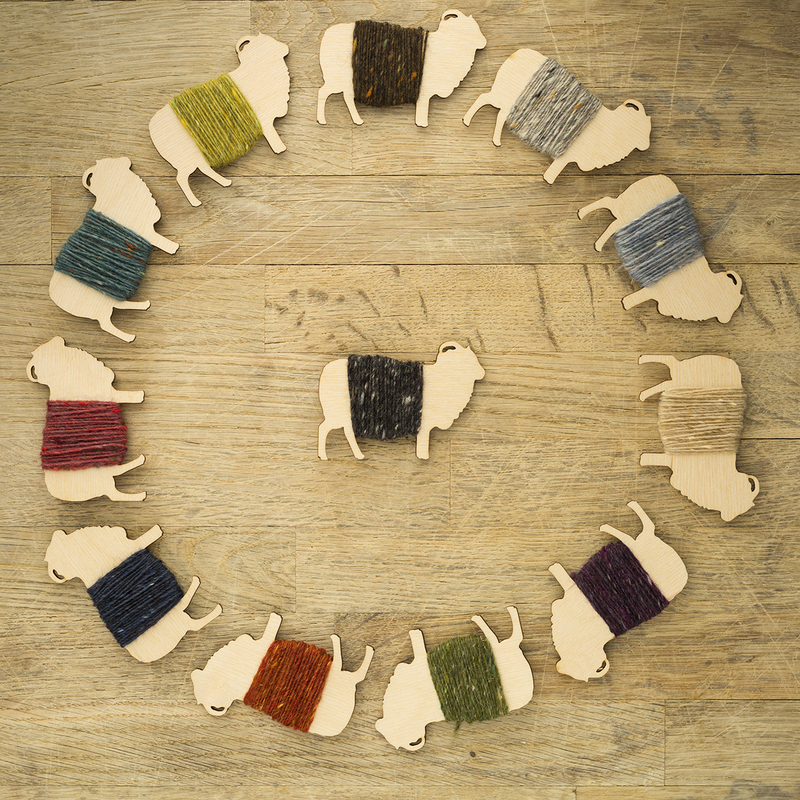 To read more of that story, you’ll have to wait for my Colours of Shetland book . . . It probably cannot be too hard to adapt the pattern to a splendid skirt. 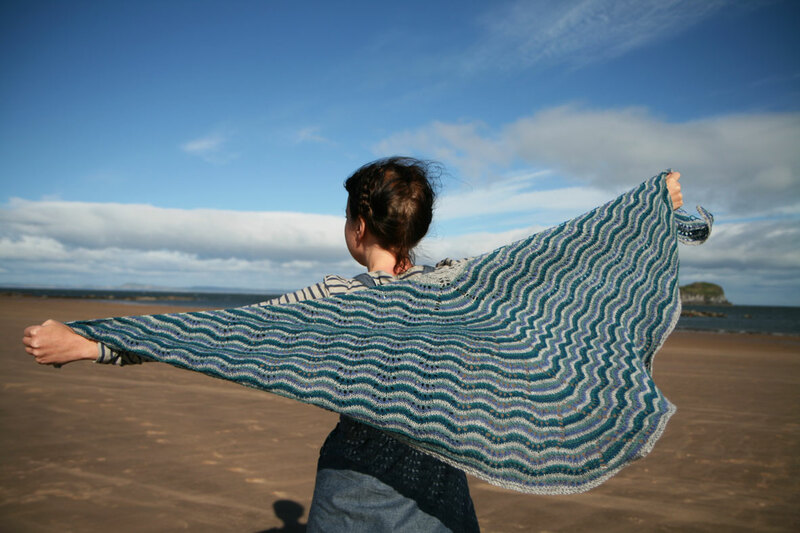 Looking forward to your book, and with summer approaching there’ll be plenty of tme to knit some goodies for next winter; starting with this beautiful shawl. I really hope you put together a lot of kits. I am far from your suppliers and I have about 6 things queued. I want to buy from you direct, so I may combine shipping. I hope you are ready, for the avalanche of orders if you put kits together. I want to knit with the yarn as exactly as you designed. I do not want to substitute even one ball. Kits please!! Devoted daily fan from New Zealand. I’ve been knitting for over 50 years and I am going to buy a copy of your book as soon as it arrives in Canada. The shawl, when you let it fly reminds me of a butterfly….so beautiful and meaningful to me in a spiritual way. 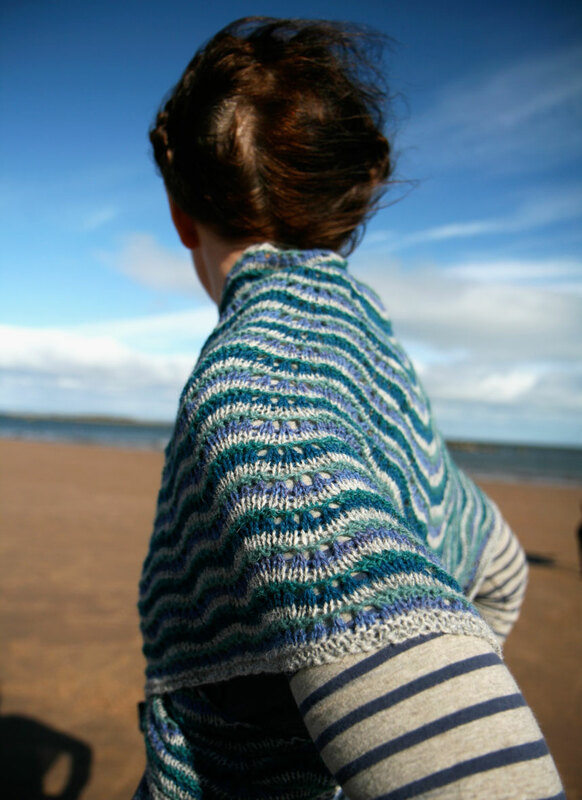 Kate- What a wonderful take on the simple hap. It is lovely. The design is beautiful, and the colours work really well together! I’m looking forward to read more on the story of this design! So far I’m really enjoying the wovember posts and your extra posts here! This is the shawl that my rainbow, colour block, hand spun, silk and bfl has been waiting for! Will it be out in time for my Christmas list? Can’t wait! such lovely color and fiber work. So excited for the book! I want to cast this on now! 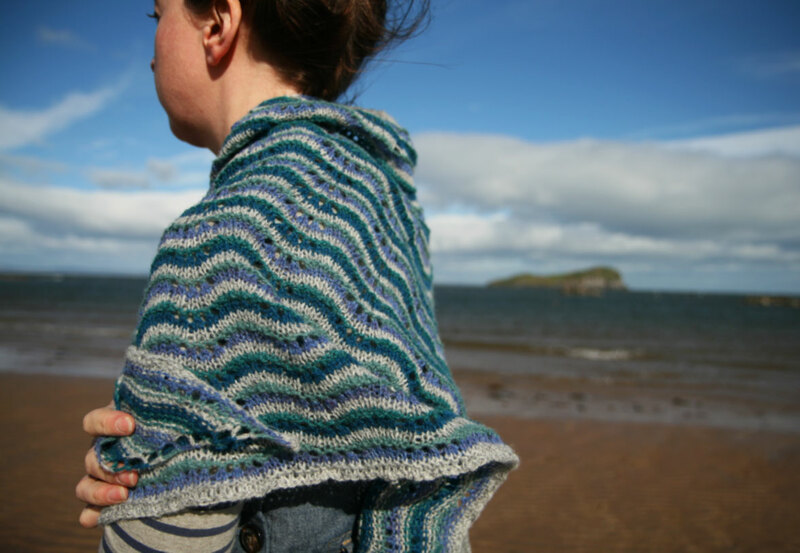 Oh, such a gorgeous shawl! I absolutely adore the center shaping detail, and the colors, too. 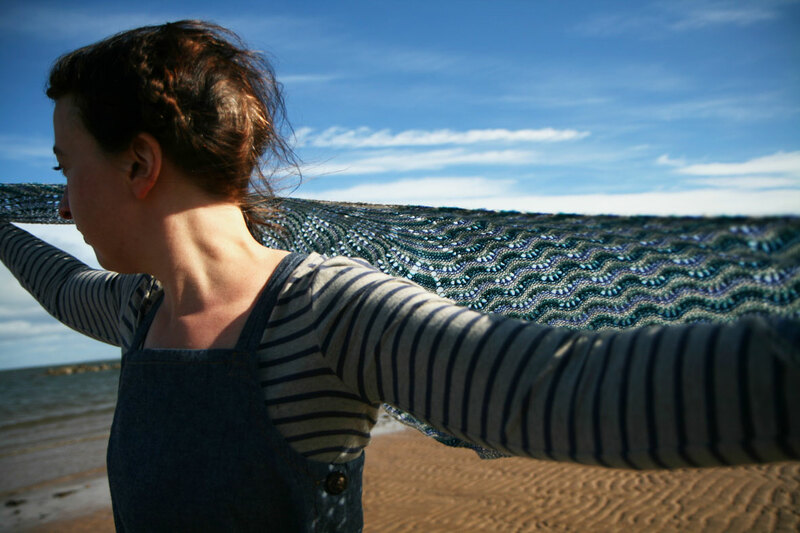 I haven’t knit a shawl in ages now, but yours is really tempting me! I eagerly, eagerly await your book! Oh my! Beautiful. Anxiously awaiting your book. Beautiful! I am tempted to frog my current 3-colour project and make this instead. But I might have to buy another colour – my colours are more Pacific Northwest than Northwest Scotland. Add me to the chorus of those who “can’t wait”. Thank you for finally ending the torture…it has been so lovely to look at the colours and even better to see the whole piece. Really can’t wait for the book. 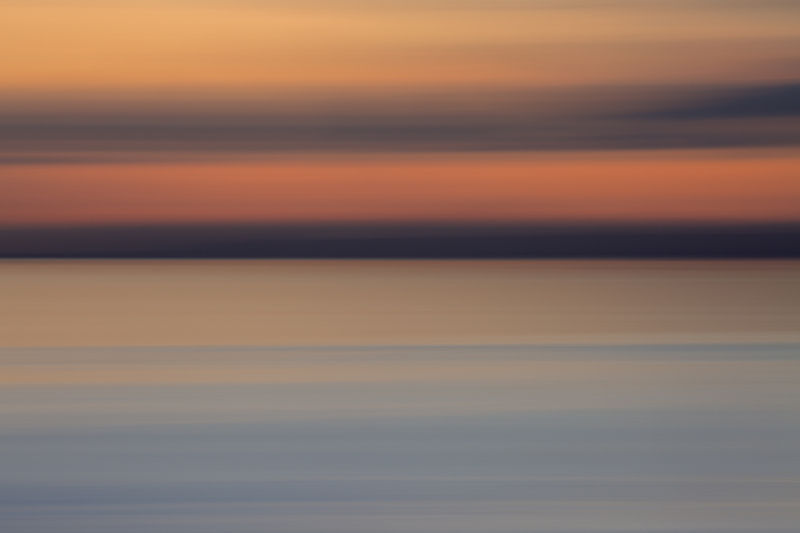 lovely, absolutely lovely colors, shape, waves. What level of a knitter does one have to be to be able to knit this? lovely shape, lovely colors. I’ll add my voice to the chorus waiting for your book. Gorgeous, Kate! Like you say, a lovely combination of traditional and contemporary. I’d love to see it in lots of different combinations too… So looking forward to the book! My sentiments echo Bethany’s. I’m definitely curious about the way you’ve fashioned the shawl around yourself. Is there a pin hidden somewhere? 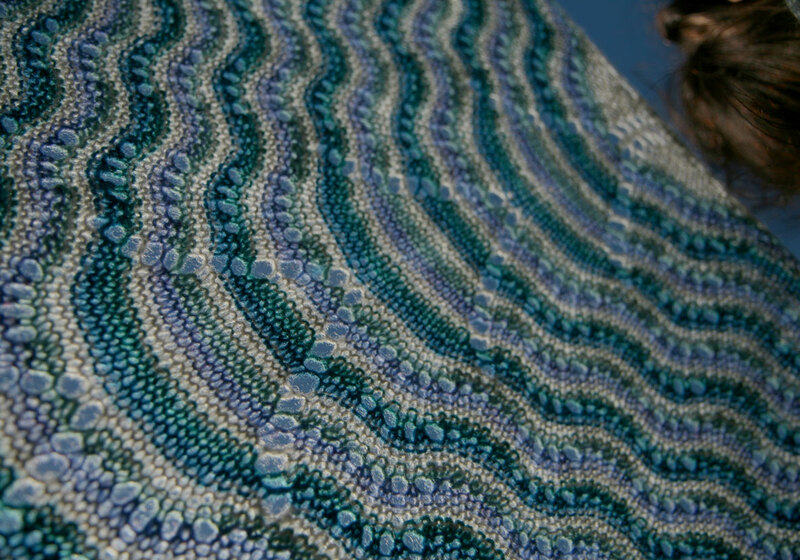 The shawl is beautiful and I love the center scalloping. I love the colors, and the wavy stripes in the pattern. Its a lovely pattern, and I can’t wait for your book! That is beautiful! I’m not usually a ‘shades of the sea’ person – preferring earth/foliage tones – but wow! I am seriously tempted by this… of course, I’d have to indulge in a whole new wardrobe to compliment it ;-) Love the ‘pinafore’ peaking out from underneath too.. is it a pinafore? I’m very new to knitting but your designs and especially this one are exactly why i started knitting. Something that combines so many great things can only be something very special. I can’t always afford to knit with pure wool and I can’t always afford to buy pattern books but this is worth the patience and the extra cost. I love it! Can’t wait for the book! Lovely shawl. I love it wrapped around your shoulders and waist. Any shawls I made are more like shawlettes, however I may have to make this gem. I am excited for the publishing of your book, and I look forward to having one of my very own! Love love love the design. Takes me back to our holiday in Shetland this summer when we stayed in the sister lodge to the the one you stayed in for Shetland wool week..can’t wait for the book. Love your blog, designs and zest for life. The centre shaping is pretty cool. The shawl is lovely, but I’m completely distracted by the way you’ve wrapped it. Are the ends tied? tucked?? 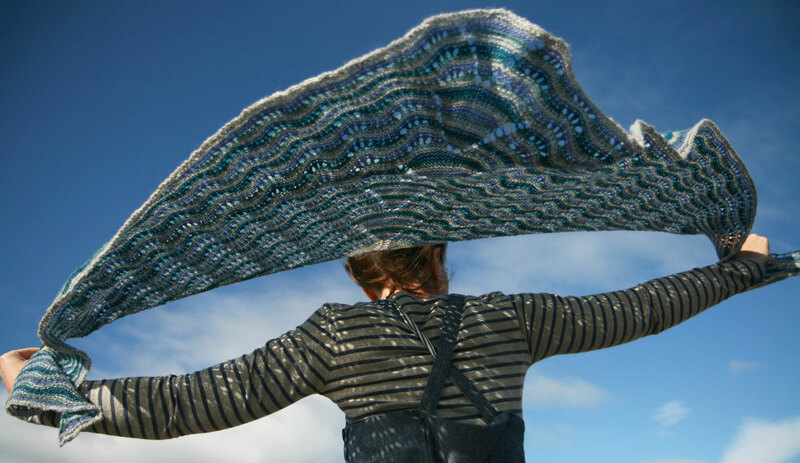 It’s such a perfect way to wear a shawl of this shape and I’ve never thought of it (or seen it). Oooooo….ravishing….thank you for sharing….I can’t wait to get a copy of your book!! Lovely! And the photographer did a wonderful job! Splendid! I particularly like the way the center shaping segues into the feather-and-fan section. Well played. I love how you captured the water! The waves and colours are so perfect against the background. Thanks so much for putting our guessing to an end with your kind reveal of one of the designs. I’m joining everyone else with finger poised over the “buy” button when your book comes out. Thank you for giving in to our communal and well meant pressure …. Look at all these wonderful comments, people you inspire! I noticed the distinctive shaping immediately and wanted to spend time studying your innovation. So looking forward to your book. 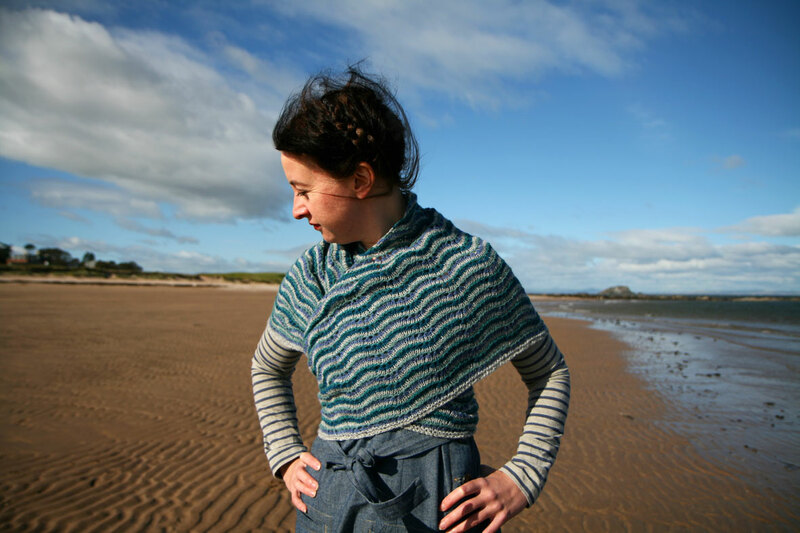 wow….just wow…..looking for the perfect shawl pattern,and i think i may have just found it…..so beautiful!!!! I’m halfway through the BMC and know that this will be on my needles as soon as I get hold of the book. Love working that Shetland openwork. On a side note is your lovely dress by Seasalt? Love the colours. 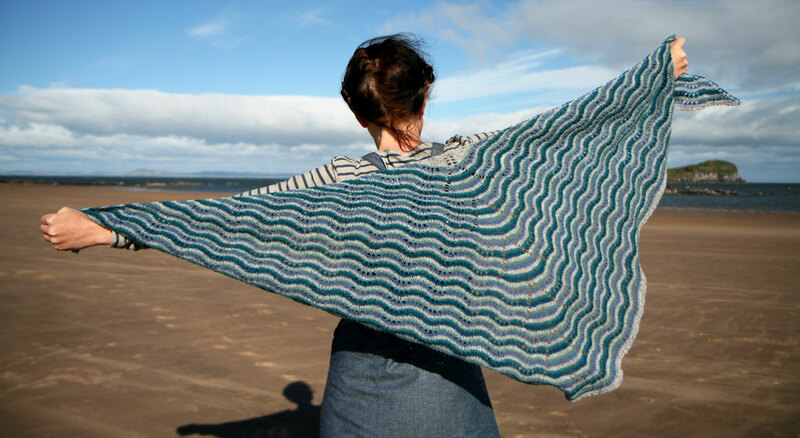 Haven’t yet knit a shawl – don’t really wear them – but think I’ll have to start now! It’s a beautiful shawl. I’m excited to see the rest of your book. What Mary Anne says! Absolutely on tenterhooks for the book! Gorgeous as always! Love how the sand ripples on the beach echo the stitches. I know that we all overuse the phrase “I can’t wait for this”, but I really can’t wait…..so eagerly looking forward to the publication. I’m so happy for you as you add another feature to your business. The shawl is beautiful. I love the shawl tied around the waist. Not long till I can buy the book. I have been curious about the tantalizing photo and now I know a little more. Waiting (im)patiently for the book and praying it will be available in the US immediately! I love the texture and colors. I don’t know if I can wait until I finish my Betty Mouat cowl to order this yarn. ack! I can’t wait!! So beautiful. i am so very excited that you have taken as your them the colors of shetland. i’ve been mooning over them and hoping you would make something of them ever since i started grokking your pix.